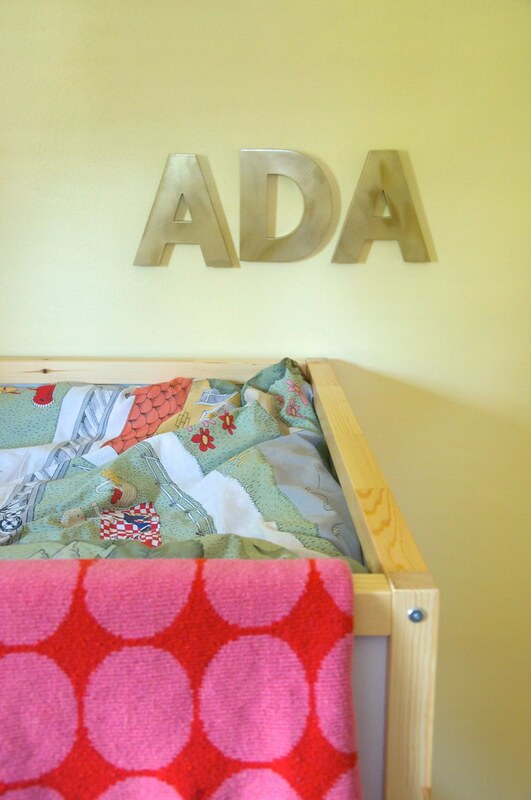 I haven’t shown photos of Ada’s “new” room at our “new” house . . . and we’ve already lived here a year. And in the past year, we’ve transitioned from the crib to a bed to now to a lofted bed. 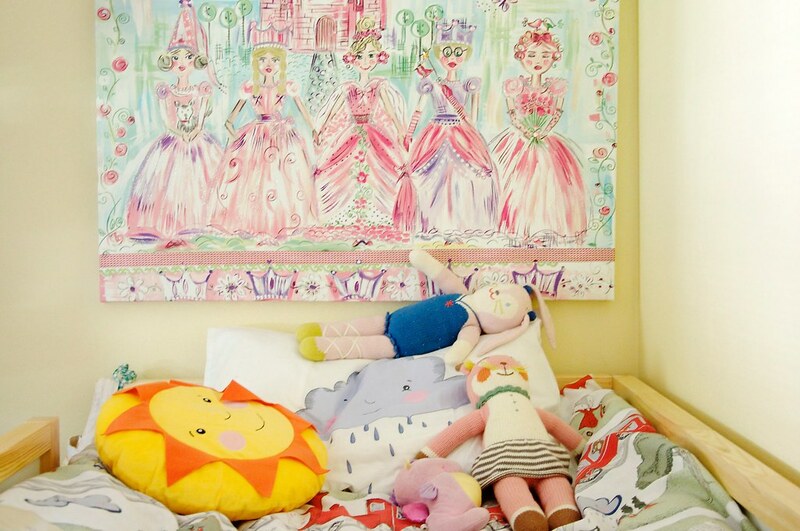 Her room has been a space of transition, and I’m sure it will continue to change and evolve as she grows. There’s really no rhyme or reason behind much of the decor. 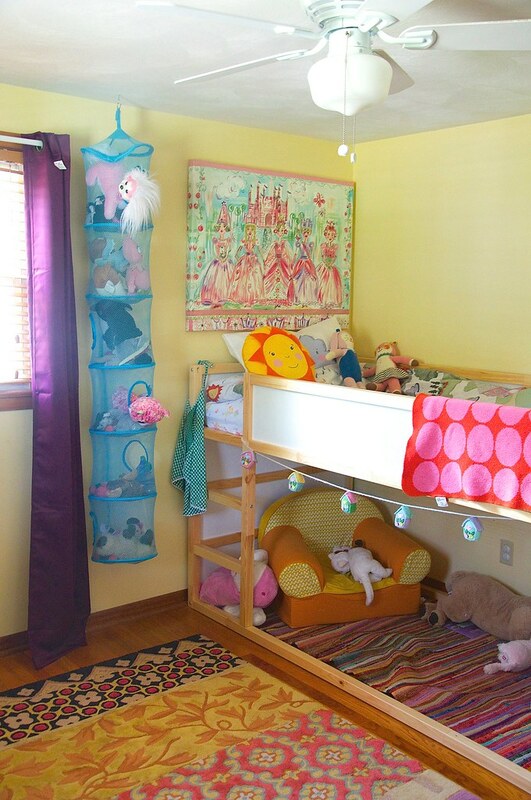 This room was pieced together over many months, so there really was no master plan. 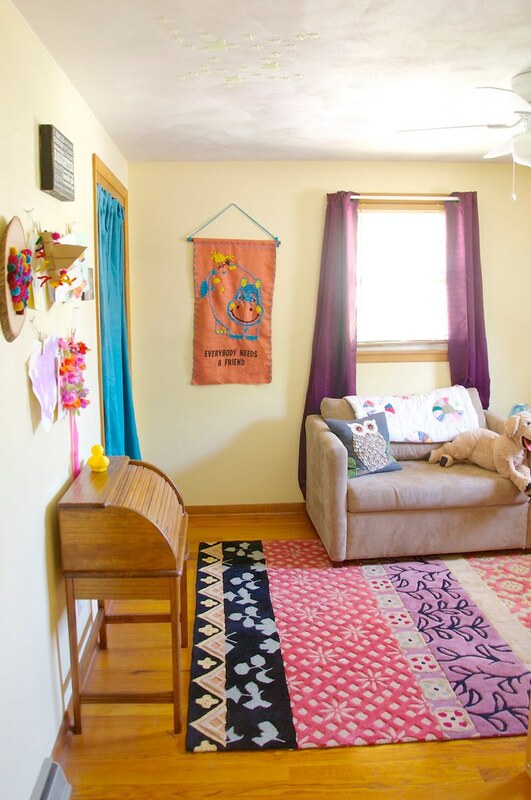 Nothing really matches, yet -- at least to me -- the space seems to flow together in an explosion of rainbow cheeriness. 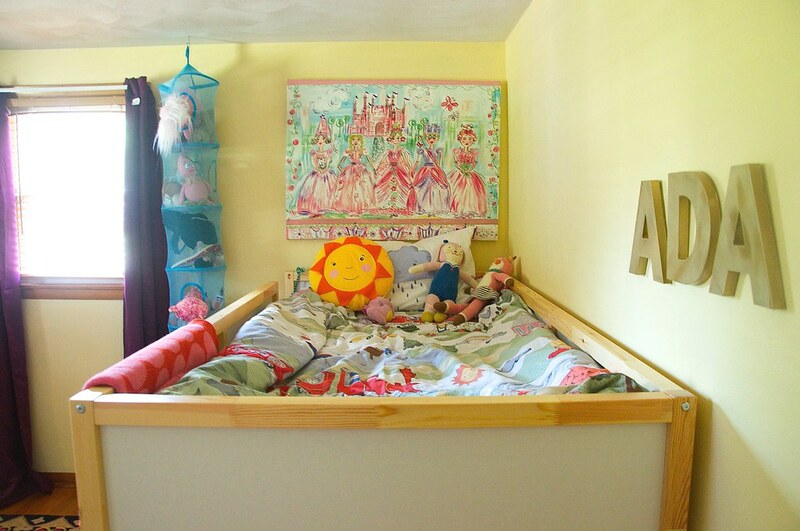 Bed: Ikea KURA. We had my brother pick it up for us last year because our closest store is almost 3 hours away. 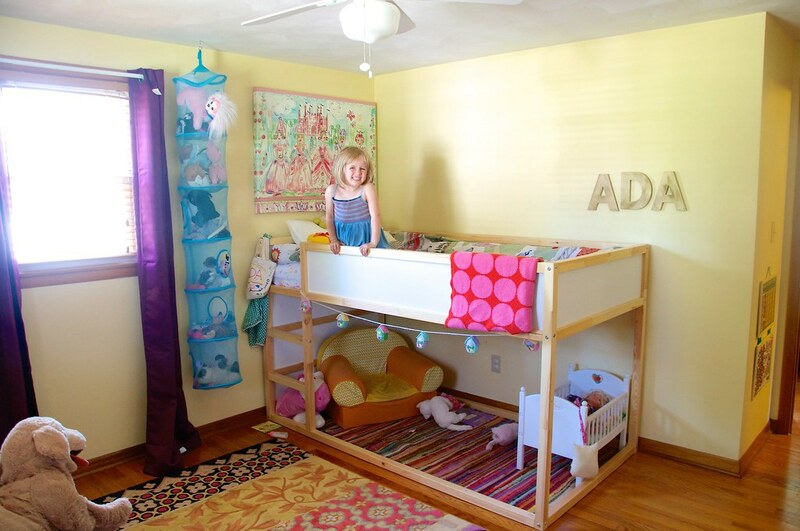 Here’s a very cute + inexpensive loft bed if you’re in a similar situation. Wall hanging: Thrifted on our NYC trip. Curtains: Eclipse Kids Blackout in purple. Hanging sorter: Ikea PS FANGST. Rug: Safavieh! 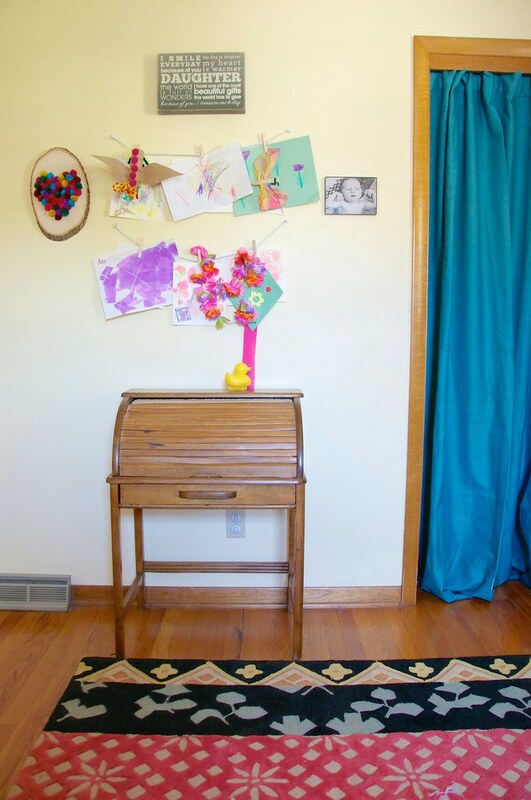 I have had SO many questions about this rug and I finally found it again! And it’s cheaper than when I bought it several years ago. 6x9 foot. Kid couch: Nod chair. I got ours on super sale years ago. Baby crib: Bitty Baby by American Girl. Ours is an old version my MIL found at a yard sale. Heart art: DIY -- here’s how. Glow stars: Wonder Stars Super Kit. Desk: Thrifted. Here’s a similar one -- it’s adorable and probably much sturdier than our antique version. Knit animals: Blabla Dolls. Ada has Suzette the Fox and Mirabelle the Bunny. Garland: Home Goods. Here are similar felted garlands.